Brand new balls from McMaster Carr… .2812"
Used balls from old GM Saginaw pickup box… .2812"
Used balls from mystery box with 50/50 polished / matte colored balls. Polished ones were .2812". matte ones were .2805"
All measurements were done with a Mitutoyo 0-1" mic, by hand… so the numbers are close but not perfect. The big surprise to me was that the grey-matte ones were so much smaller! Don, thank you for this link. I'll definitely check them out today. I'm waiting to see what Dennis Carpenter Industries come up with as well as they have seats in stock, but the Lee set has the installation tool and THAT is a bonus for sure. Next question would be "how to get the old seats out without damaging the pressure side one way valve thingy" I guess it's probably on YouTube! With all the information bought forward in this post, it will help me for sure, but unfortunately the supply of these NOS replacement ball sets is very limited. Yes, my set of balls measure about the same!! The dark ones I am told are much smaller to prevent jamming the ball screw. Interesting about the McMaster& Carr ones. I had not thought about them as a supplier. The set of standard 9/32" balls I ordered, not yet picked up, have a tolerance of +/- .0001 or.2811 max. These might do in a pinch, but still on the small side if the worm screw is worn at all. (10-29-2018, 07:44 PM)donkost Wrote: Love all the talk of old airplanes. The "Mid-Atlantic Air Museum" is only minutes from my house, and they have dozens of aircraft on display from the 20's through the 80's, including a B-25 and a P-61. I thought they also had a B-17 but that might fly in for special occasions. This is just outside the grounds of the Reading (PA) airport, which used to host one of the largest air shows in the US. Now they have a large WWII weekend in June which attracts many thousands of visitors. On that weekend I will have aircraft such as B-17, B-25, P-51, and even a B-29 (Fifi) flying directly over my house at low altitudes. There's no mistaking the sound of those old radial engines. Me too, Off subject, but as said before it's my post. A few weeks ago, there was a B29 in Windsor, but unfortunately I was unable to go see it due to my completely f'd up hip. I would screw a sheet metal screw into it and use a small slide puller to pop them out. That might work. The Ford manual shows the use of a 5/16-18 x2" bolt with a nut and washer. The trick is to use a tap with grease on it and thread the insert just enough to hold the bolt, then use the nut to pull it out. I had skimmed through the section, but somehow missed that part. As for the correct 'kit' for the pressure side, Dennis Carpenter Industries emailed to tell me they don't have it under #374309-S, but the Ford number is C5AZ-3D728-A. Green Sales do list it under that number and I'm waiting for a quote. This is with the check valve and new seat I assume. Geoff, the 374309-S is the part # for the seat only. C5AZ-3D728-A is the part number Ford released to service the pressure side with what they called a connector, a poppet and a spring. I have dealt with Green Sales before, so usually if something is not ultra rare or off the wall, they usually have fair prices. There are two B-29's remaining which are capable of flying- "Fifi" and "Doc", so it had to have been one of those. Similar situation to the Lancaster bomber where I believe there are only two remaining which are able to fly. (10-30-2018, 04:11 PM)secluff Wrote: Geoff, the 374309-S is the part # for the seat only. 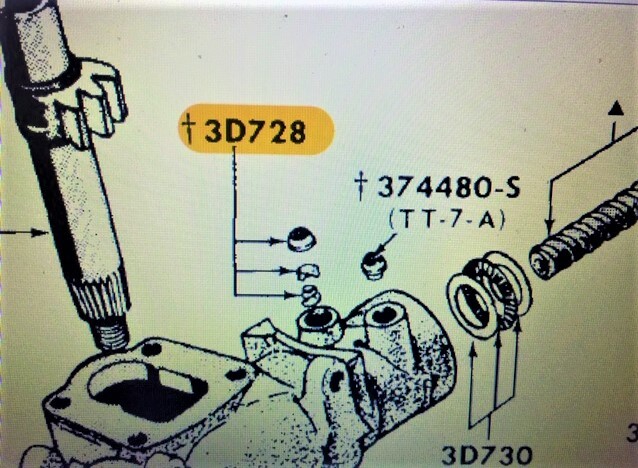 C5AZ-3D728-A is the part number Ford released to service the pressure side with what they called a connector, a poppet and a spring. I have dealt with Green Sales before, so usually if something is not ultra rare or off the wall, they usually have fair prices. Steve, thanks once again. I'll see what Green Sales come up with for price, but I'm finding these parts are scattered amongst the few dealers meaning buying one part from A. one part from B etc. and having to pay shipping from all of them. Hmm, getting expensive!! No wonder the price of a reman is so high. I'll post what I find and decide to do once I have all the details.